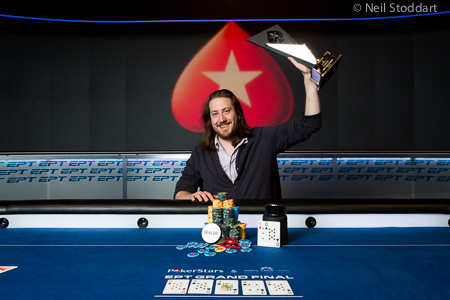 Home Steve O’Dwyer Wins EPT Grand Final, Besting Best Final Table…Ever? This win can pay for a lotta grilled cheese sandwiches. 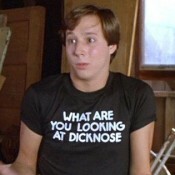 Sure, Steve O’Dwyer may look like the Southern fraternity brother we had in the ’90’s who liked acid, weed, devil sticks, and Phish a liiiiiiiiiiitttttttttle too much, but fuckina he’s tearing up the poker circuit. O’Dwyer, 31, defeated what many are calling one of the best naturally conceived final tables in modern poker history at the EPT Grand Final. 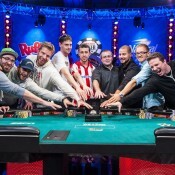 The line-up was ridiculous: Daniel Negreanu, Jason Mercier, Johnny Lodden, Jake Cody, Andrew Pantling (Matchbook.com exec), Noah Schwartz. O’Dwyer conquered the field of 531, earning €1,224,000. 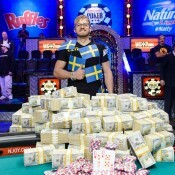 He defeated the aforementioned Pantling (€842,000) heads-up for the title. Daniel Negreanu finished fourth, earning €321,000. The cash puts Negreanu third all-time on the poker tournament career money list–or first all-time if you knock-out the OneDrop event. Back to O’Dwyer, check out his year-by-year stats here. It’s like he visited Adrian Peterson’s doctor and went on poker PEDs in 2011. Get full EPT Grand Final results here.